More and more people are taking the plunge and going into business for themselves. Job security is not what it used to be many realize their position can go away or they are vulnerable to replacement. Others have made some steps towards self-employment but have questions. Find out more about this growing industry of business entrepreneurs. 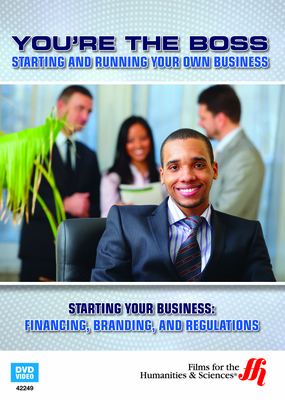 Once you decide starting your own business is the path for you before you begin purchasing products and signing leases this DVD will teach you more about the best steps to take for a more successful business. They have studied the market and know how important it is to have abusiness plan and how to take that plan to the next level. Discover how to develop your idea and learn if you truly have an audience for your product or service. Determine the cost to start up your business. This step launches your business with a solid business financing plan. Operation cost, taxes, shippinp cost, all this is cover and more. Is there a market for your product to grow in? This is where branding is developed. Get educated on potential failures or stumbling blocks. Create and execute a strong marketing plan which involves budget material for advertising and promoting your product. This step lets you put your best business plan forward and more. These questions and more are so important to increase your chances of success. Find out more about starting your own business with this DVD and take that first step today.